Project Mercury Astronauts, whose selection was announced on April 9, 1959. 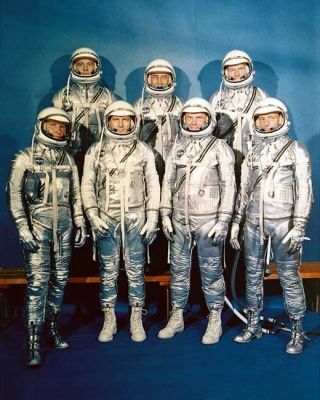 They are: front row, left to right, Walter H. Schirra, Jr., Donald K. Slayton, John H. Glenn, Jr., and Scott Carpenter; back row, Alan B. Shepard, Jr., Virgil I. Gus Grissom, and L. Gordon Cooper. Theywere seven men, all military pilots, in peak physical shape with above averageIQs. They were college educated and men of faith and family. And they wereAmerica's first "astronautvolunteers." Announcedto the press at 2:00 p.m. on April 9, 1959 in Washington, DC, M. ScottCarpenter, L. Gordon Cooper, John H. Glenn, Virgil "Gus" Grissom,Walter M. Schirra, Alan B. Shepard and Donald "Deke" Slaytonimmediately rocketedinto history as heroes, two years before any of them would leave the groundfor space. "Thenation needed support for the program and that was one way to get support, tomake the people who were doing it heroic," recalled Scott Carpenter, 50years later, in an interviewwith collectSPACE.com. Carpenter and Glenn are the only two of theseven who are alive today. "Therewere so many unknowns and conquering those unknowns was scary to people. Itmade us heroes and I think that's okay," he added. Carpenterwould become the second American to orbit the Earth, flying fourth among hissix fellow astronauts, following the suborbital flights of Shepard and Grissomand Glenn's three orbits. Schirra and Cooper would follow Carpenter into space.Slayton would be grounded until 1972, due to an erratic heart rate, but wouldserve in the interim as head of the astronaut corps. And thoughthe Soviet Union would launch two men into orbit before the United States couldfollow, the race with the Russians only served to emphasize the heroic rolesfilled by the seven original Mercury astronauts. They were men, as author TomWolfe would later coin for a book by the same title, who had "the rightstuff". NASA'soriginal seven astronauts were joined by "The New Nine" in 1962,including future moonwalkers Neil Armstrong, Charles Conrad and John Young.Fourteen more were recruited a year later, including Alan Bean and Buzz Aldrin. Over thepast 50 years, NASAhas hired 19 groups, or classes, of "astronaut volunteers.? In total,314 people have followed the original seven into NASA's ranks, but their pathto becoming an astronaut was different. "Ithink it's changed," said Carpenter. "Of course, I don't havefirsthand knowledge of the follow-on groups, but I think the testing and thetraining of the first group was ideal and it formed the basis of a program forselection and training that served the country very well." Duane Ross,NASA's manager for astronaut command selection and training at Johnson SpaceCenter in Houston, agreed that the selection process has changed. "I saythat with some reservation because I wasn't here back then," said Ross,who, since 1978, has been a part of every space shuttle-era astronaut selection. "Thereare some similarities, in that we have some basic requirements you have tomeet. Academic requirements are the same as they were back then, that is adegree in either engineering, math or science," explained Ross. "Wecertainly still have physical requirements, even though those have obviouslychanged a little bit as we get smarter all the time. There were heightrequirements back then, we still have height requirements," he added. "And there was a board, I think, that was convened to do that process andwe still have a selection board." "Ithink the kind of things that we are looking for are quite a bit different thanthey were back then for the original seven," said Ross. NASA ispreparing to hire its 20th class of astronauts in May. The candidates, who havealready gone through two rounds of interviews, have demonstrated that they havethe "stuff" for the job, but it's not "the right stuff". "In myopinion, and this is just my opinion, I would say no," replied Ross whenasked if the new astronauts had the same qualities as the Mercury astronauts. "It is a little bit different and it's different for a couple ofreasons." Continuereading NewAstronauts Don't Need 'The Right Stuff' at collectSPACE.com.